For my next project, I wanted to explore the interaction of animation and video using AfterEffects. My goal is to somewhat seamlessly marry a tracing-paper type animated character with a character shot with a DSLR in environments of varying light. I had this idea in such a hurry that I wrote the concept on a nearby envelope. Here is the storyboard. The story is of a girl who always wanted a pony and gets one. The beginning is her writing at a desk, broken (see the beginning of Moulin Rouge) and the flashback to the day she adopted a little animated horse. Que montage of frolicking and bonding. Then a scene at a veterenarian’s shop with a clipboard. The pronounciation of a short lifetime for the horse. Sitting on a bench contemplative. A scene where the horse sleeps at the edge of the bed. Then an impression and an unmade bed. Perhaps the sound of sobbing in the background. A montage of empty scenes where there was once an animated horse. 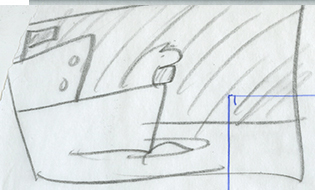 The last scene: a boat sailing with the horse at the bow, looking eager. The last scene is completely animated.